By Rachel & Rabin, Cornell students. This blog post is coming to you train traveling from Trivandrum to Madurai where the six Cornell students continue their spring break. While our break has nothing to do with the course we have just completed at Keystone Foundation, and although we are apart from our friends and colleagues back in the Nilgiris, the past few days spent apart from them has allowed us to reflect on the past seven weeks, coming to terms with our discontents and rejoicing in our victories. We want to summarize and reflect on the adventures of the last few weeks. 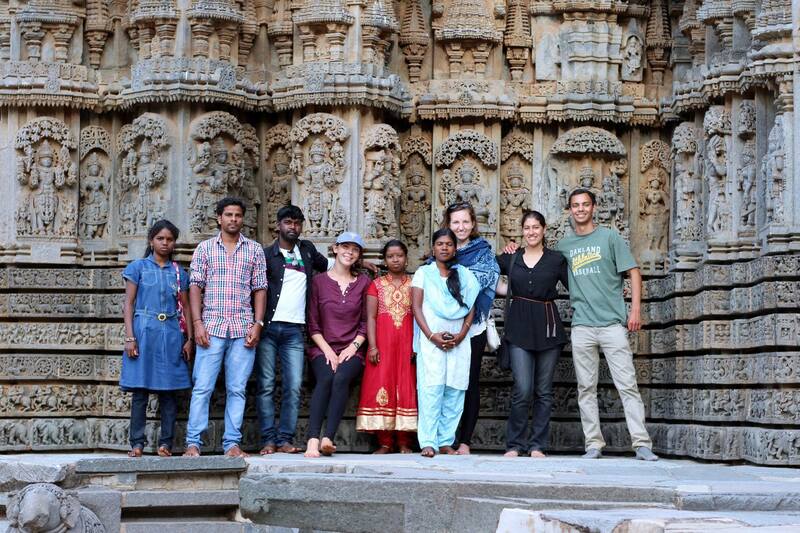 Two weeks ago, the Cornell and Keystone students spent the weekend in Mysore, where we stayed with an organization called the Swami Vivekananda Youth Movement (SVYM). 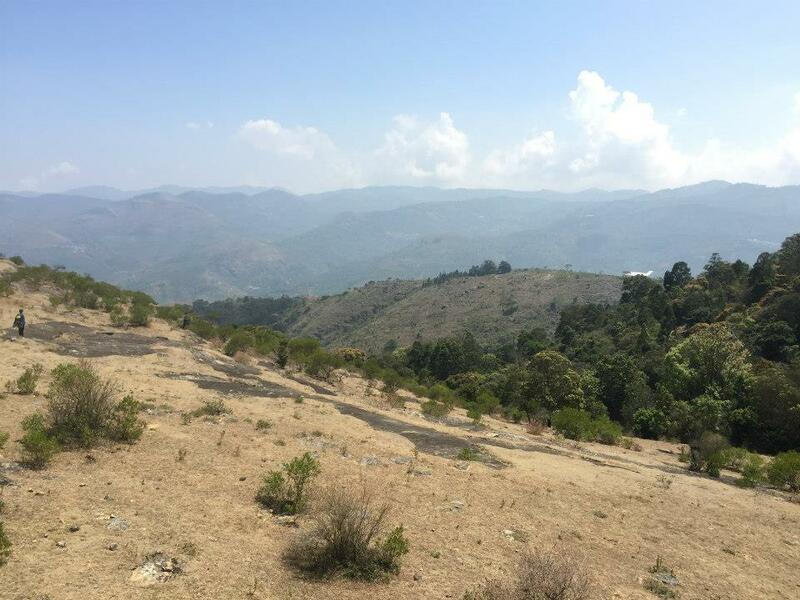 This field trip occurred in response to a strong desire from the Cornell students to explore a new place outside the Nilgiris. The Keystone students were a bit reluctant to go to Mysore, as this is a city that they know well because of its close proximity. Ultimately, we all boarded the bus with the familiar excitement of a field trip. After all, we have learned to love the connections made across cultures during such bus rides and this one lasted seven long hours, filled with squeals, laughter, and blaring Tamil music. The camaraderie cherished during the past bus rides carried over throughout the entire weekend. What was old to the Keystone students now became an opportunity for leadership. 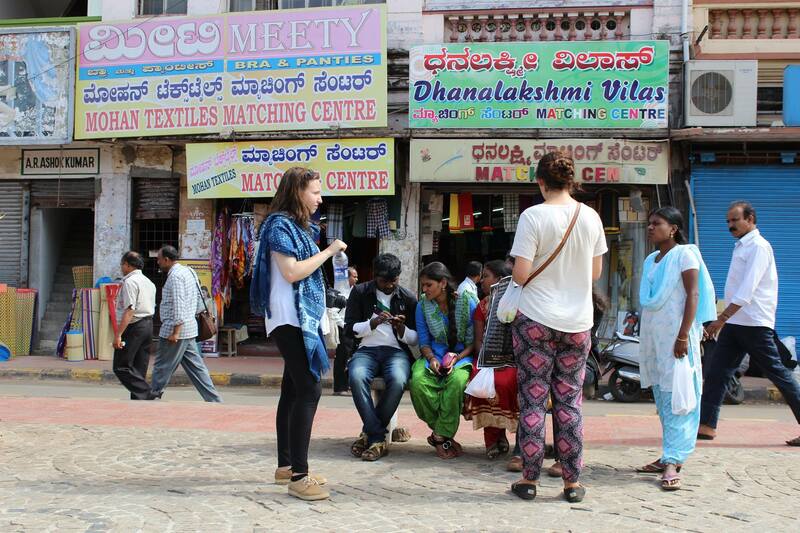 Jackie checks out the marketplace in Mysore. 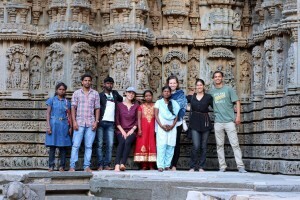 At SVYM, we spent the first morning learning about the work that they do with tribal communities in the Mysore area– it was interesting to compare this with Keystone’s work in the Nilgiris. Afterwards, we visited the grand Mysore Palace and the old Devaraja Market, gaining a new perspective on a different side of India marked by the sights, smells, and sounds of a historic and culturally-rich city. On our last day, we went to the historic town of Seringapatnam, where the 18th century ruins and monuments of the Muslim king Tipu Sultan still stand. 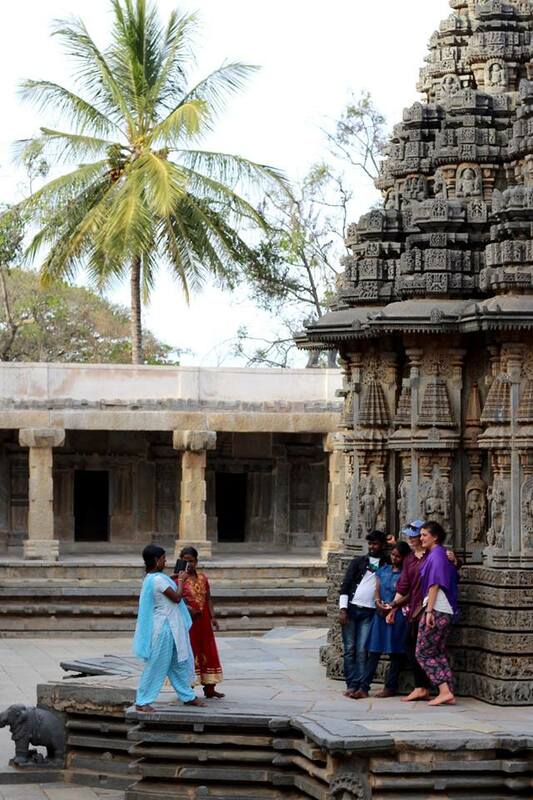 A highlight for all of us was our visit to the Keshava Temple in Somnathpur, just outside Mysore. We almost skipped it altogether due to the heat and dwindling time. Maybe it was the brief stop at McDonald’s or the unwillingness to give up, but somehow we managed to force ourselves to continue on, to visit the temple we had travelled miles to see. We are perpetually happy that we did just that. Everything about the temple overwhelmed us. Arriving just before dusk, soft light illuminated the intricate details of the ancient temple’s carvings. The details of every square inch told a story and history of people, culture, and religion. And beyond this, the atmosphere breathed peace. Both Cornell and Keystone students scampered around the temple studying the walls and posing obsessively for photographs. This temple was new to all of the students, apart from Rabin. But even Rabin appreciated the temple’s unique beauty after several visits. As the sun began to set, we said goodbye to the temple and headed back to the bus. This long day was a success. Skipping ahead to our return – Monday, we had to hit the ground running in order fit in the curriculum’s finale in five short days. Still, we were determined. This week may have been the most intense yet, covering two units in this short time. Somehow we managed, absorbing the content of lectures, making the most of our usual Wednesday field trip, preparing our livelihood projects, finding time to pack and tie up loose ends. This week demanded every minute be active, relenting only at the last moment possible. In many ways, it was a microcosm of our entire NFLC experience up to this point. There were moments of frustration as well as relaxation and happiness. There were times when we had to think hard about complex issues as we stood in the hot sun staring into a water spring box. Then, we had to wrap our heads around the concepts of livelihoods that were being carried on from several weeks back. The long hours of class became tiring, but something changed towards the end of the week. All the students began making connections across themes, and we engaged in activities that helped us think forward to our upcoming research. In a broader sense, we all began to fully understand what we are here to do. It was Friday night, and all of the students were still processing the fact that we had just finished our seventh and final week of classes. Our final debrief left us remembering the successes and challenges of the past weeks, and immensely thankful for the investment that each member of Keystone had poured into us. Sitting around the classroom, in a circle so that everyone could look each other in the eyes, we cherished the bonds that pervaded across language, nationality, age, and culture. The debrief also gave us a chance to contribute our opinions on what we thought did not work so well throughout the course to this point, such as the volunteering activities. We felt glad, though, that our thoughts would go towards improving the course next year and the year after. Even after this conclusion to the class period, our work was not yet finished. The rest of Friday night was spent in the classroom, Cornell students and Keystone students busily working together in order to complete the last assignment. By midnight, no group had finished, and as much as we dreaded the assignments before us, we valued these last moments spent as a class. Looking ahead, we knew that we would continue to work in parallel to one another, but from here on out, research would take each group in a different direction and the community that we had built would no longer be accessible in the way that had become familiar to us. As the early morning stretched on, projects came to completion, and students headed to bed in their dorms for one last night before leaving for spring break. Just a few hours later, in the dark of dawn, the Cornell students lugged our backpacks to the car. We loaded up the car and began our journey across the South Indian landscape. But we could not depart without first bidding our fellow students and friends farewell. Although it was six in the morning after a late night of hard work, the Keystone students made the effort to get out of bed and meet us at the car to say one last goodbye. This gesture by the Keystone students touched each of us Cornell students. Hugging each other goodbye imprinted an intangible, inexpressible sense of fondness and attachment for one another– one that captures the power of humanity and cannot be limited by language, country, or culture. Spring break offered the respite we all needed to reset before beginning the research phase of this course. This break consisted of some of the most exhausting moments and some of the most relaxing moments we have experienced yet, but all the while we grew closer as a batch. By the end of our travels we felt ready to return to Keystone. After all, absence makes the heart grow fonder. As the last days of break come to an end, we all look forward to waking up in our Keystone beds and being reunited with our friends. Now, we are feeling ready to dive into our research with the support of our NFLC community and the excitement that will come through learning in the field. Let the games begin! Photo credits: Cornell students [via Facebook].